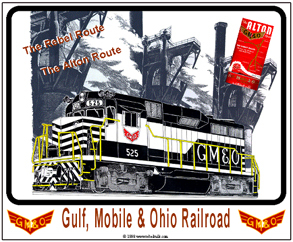 One of the first railroads to operate a non-steam passenger train, The Little Rebel, the GM&O was a progressive, modern railroad with huge shops in Casey Jones town of Jackson, TN. Another old favorite returns, the famous Gulf Mobile & Ohios winged logo on a light grey/ash premium 100% cotton tee. Unique to the Gulf Mobile & Ohio, these first out of the factory ALCO FAs wore low mounted headlight and the trim behind the cab doors was similar to that on passenger PA diesels. Featuring a new GP30 diesel locomotive in as delivered black & white color scheme. 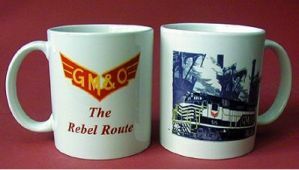 Coffee Mug featuring the GM&O Railroads winged logo superimposed over the paint scheme of its diesel locomotives. A very unique way to present the railroads logo. 6 inch x 6 inch square tin logo sign of the GM&O Railroad. 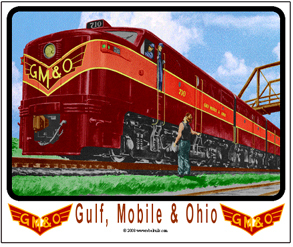 License plate featuring two logos used by the Gulf Mobile & Ohio Railroad, the Classic winged tuscan red and yellow with large GM&O lettering and the lined wing with small GM&O. 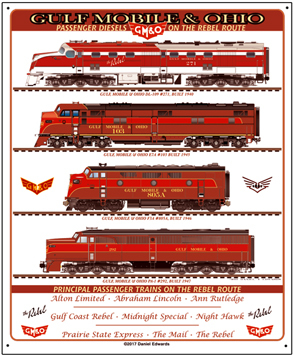 The powerful American Locomotive Company FA freight diesel was a bold design. The GM&O was one of Americas first railroads to own these monsters and the only ones with that special lower headlight and over cab number board. Mouse pad features the beautiful GM&O GP30 diesel in front of a steel mill. Your mouse may get a little warm on this pad! 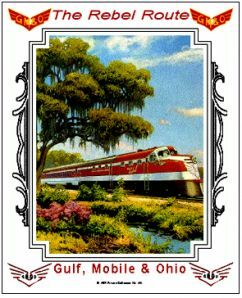 Gulf Mobile & Ohio Railroad passenger diesels are presented on this metal sign in beautiful Maroon and Red with yellow/gold trim. Locomotives included are DL109, E7, F3 and PA, along with several logos of "The Rebel Route". Reproduction & enhanced version of a GM&O RR advertisement featuring a new ALCO DL series diesel locomotive. 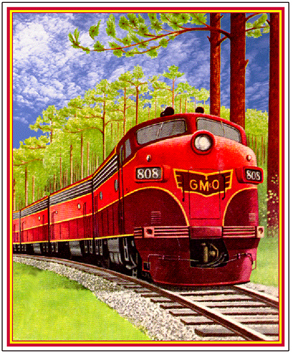 Beautiful tin sign of GM&O diesels rolling through Southern pine trees in a nostalgic scene of days gone by. 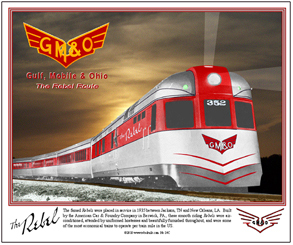 Beautiful tin sign of the famous GM&O Little Rebel train set, rolling through the night. Sign features three logos, main image and verbage regarding The Rebel.